... and bustle. Notice the emphasis on women at work in the very first moments. 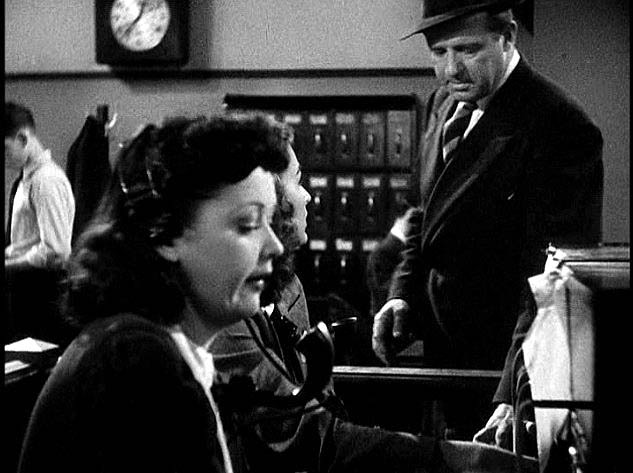 "His Girl Friday": Anybody who ever worked in the journalism business, or wished they had been around for newspapering's madcap era, must feel a quickening at the opening tracking shot of Howard Hawks' classic comedy. 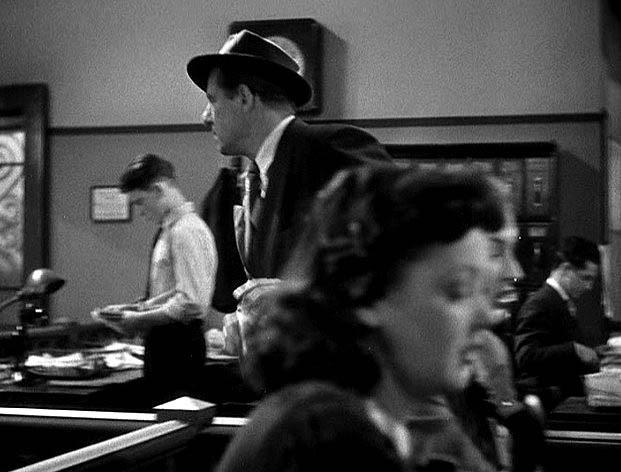 As the camera tracks from right to left across the city room of the Chicago Morning Post, a smoky, hustling, chatty ambience hangs over the enterprise, as an editor yells out for a "Copy boy! 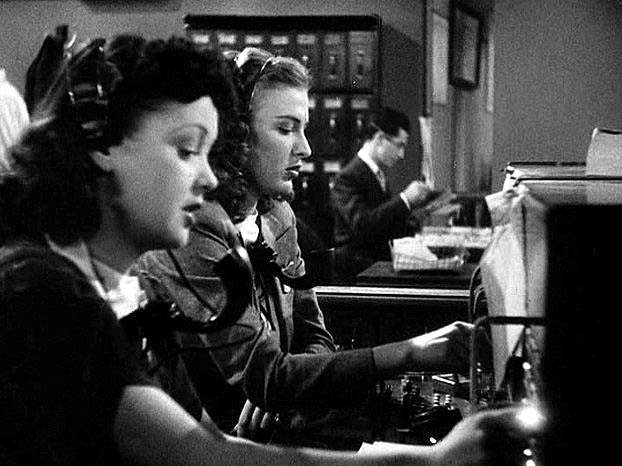 ", reporters are decked out in rolled-up shirts and green eye-shades, the women wear fashionable hats and the blue-collar switchboard gals are yammering in overdrive. The scene sets the fast-paced theme, and it never lets up. JE: Good grief, TLRHB, that's a great one! (This should give readers an idea why they should check out TLRHB regularly.) As someone born with ink in his veins (red ink, I'm afraid), I know well the quickening of which you speak! 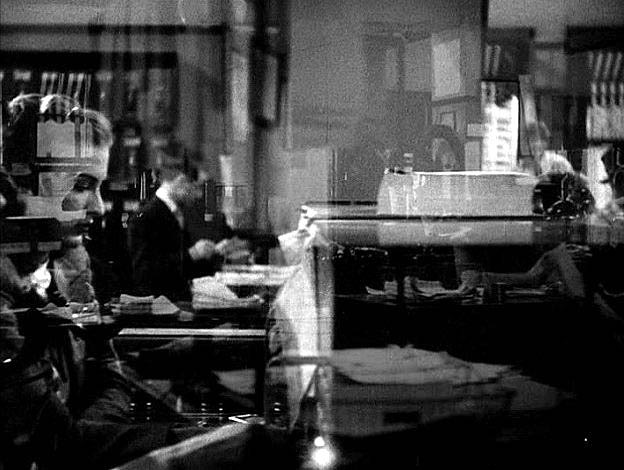 The dissolve -- camera motion remains the same. Bruce is such a polite sap. "Hello Hildy!" "Oh, hiya Skinny!" Hildy makes herself at home. You're right -- this shot practically gives you whiplash (and it reminds me of another favorite opening, where the camera shoots with breakneck speed, diagonally across an office toward Griffin Dunne at his computerin Scorsese's "After Hours" -- propelled by Mozart's Symphony in D Major that, for the first time ever, sounds anxious, urban and neurotic). 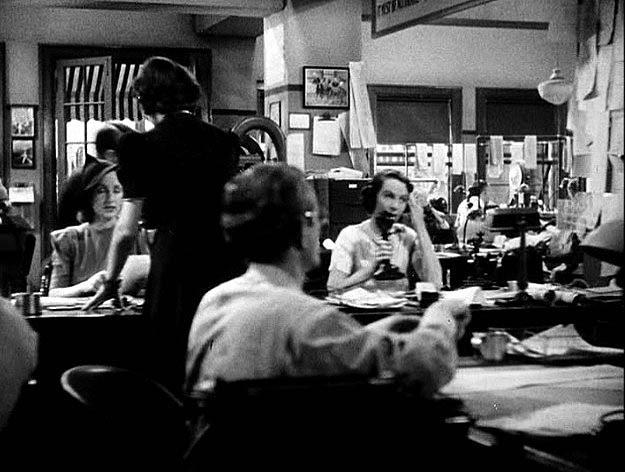 It's actually an almost imperceptible blend of two shots, a quick dissolve that carries the motion from the first (following a woman across the newsroom) into the second, which comes to rest (momentarily) on the switchboard gals. 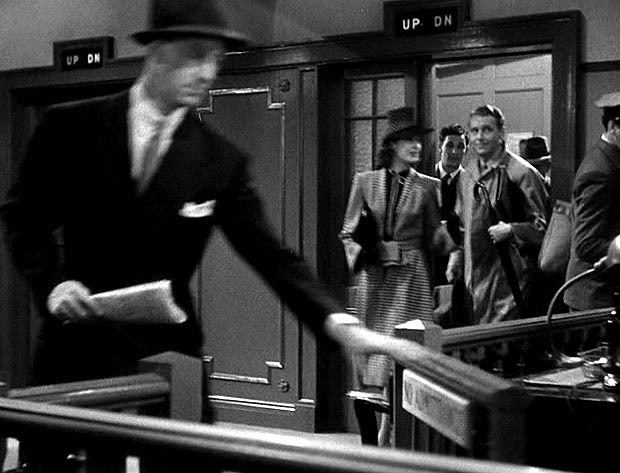 A reporter comes into the shot from the right, exchanges a few words with the receptionists, and the camera then continues left with him as he hails an elevator going down. 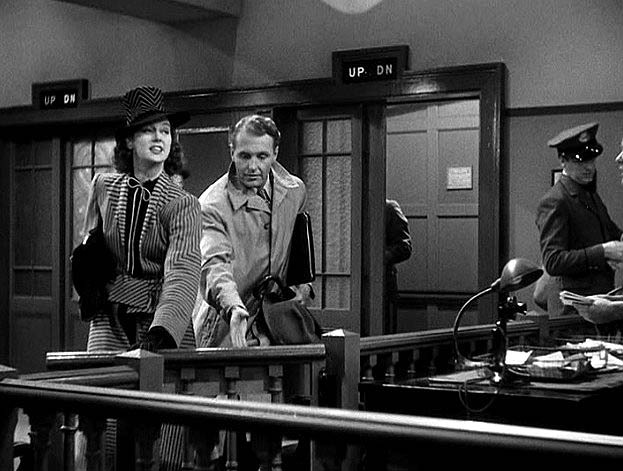 As he steps in, the up elevator opens and out steps Rosalind Russell and Ralph Bellamy. 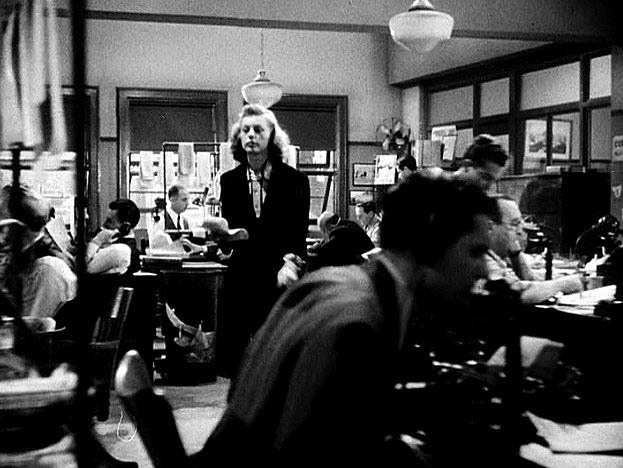 The camera then reverses direction (bringing, as it turns out, the long-absent Hildy Johnson (Russell) back into the newsroom. Nice bit of business where fiance Bruce (Bellamy) holds the gate open for her. 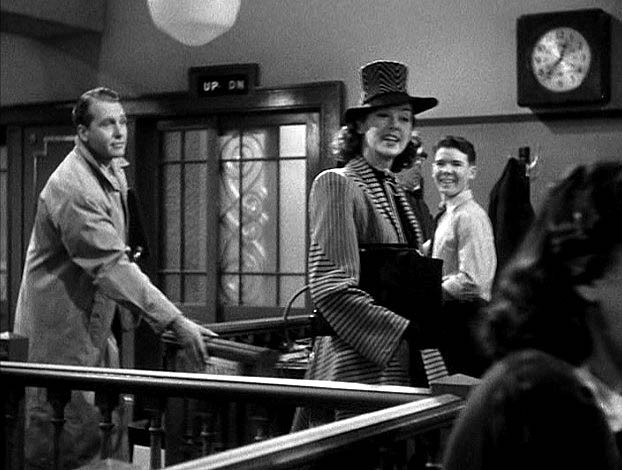 We move back to the switchboard, Hildy has a few words with the girls, and then darts out of frame left, as if she's just too quick for the camer -- the frame can't hold her for long. There's a cut, but it's just to a medium two-shot a few feet away, of her and Bruce. This is a snappy, invigorating hardboiled ballet that leaves your head spinning (and the movie keeps you lightheaded for the next hour and a half). It's intended to feel like one shot, even though it technically isn't. (Now it would be done even more seamlessly with digital effects.) It's possible the camera is meant to pass through a wall, where the switchboards are mounted. 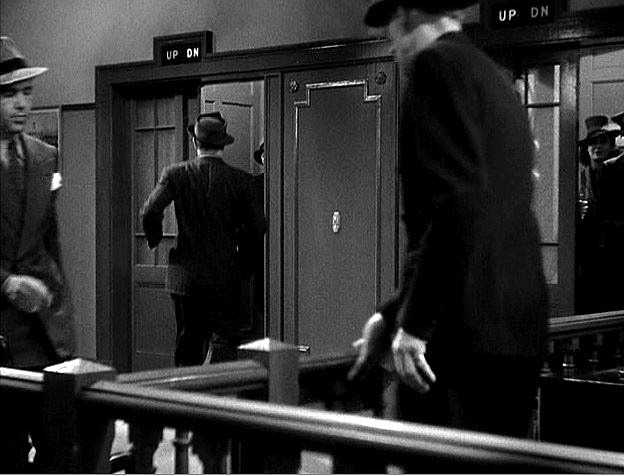 This is a relatively flashy example of that "invisible editing" the great Hollywood classicists like Hawks were known for (and a reminder that Frank Capra was doing jump cuts long before Godard). 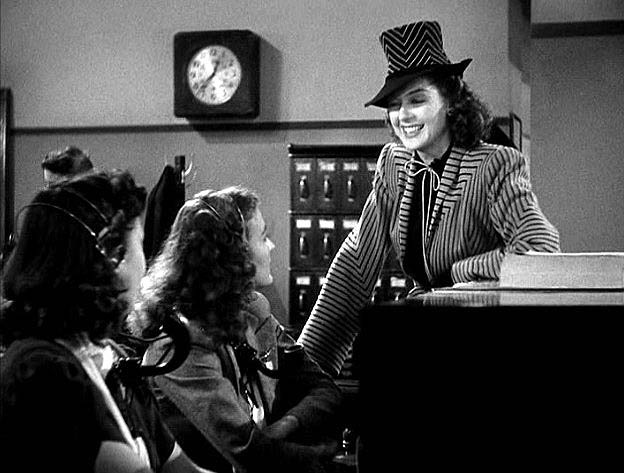 I can't tell you how hard it was to stop watching "His Girl Friday" as I was looking at this shot just now. It's available in that beautiful recently released Cary Grant Box Set, along with two of my other all-time favorite movies, "Holiday" (George Cukor, 1938) and "Only Angels Have Wings" (Hawks, 1939) -- PLUS the absolutely splendid "The Awful Truth" (Leo McCarey, 1937) and "The Talk of the Town" (George Stevens, 1942).